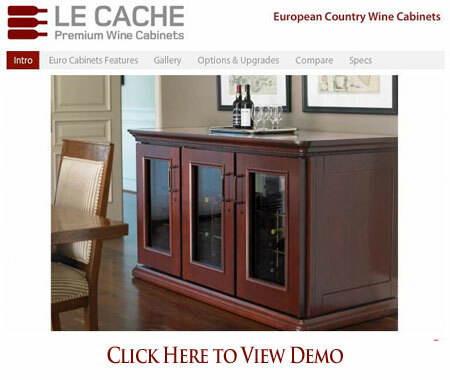 Le Cache Euro 5200 Wine Cabinet Chocolate Cherry (P/N 753). Designed by acclaimed, Pinnacle Award-winning designer Martin de Blois, our European Country Series wine cabinets evoke the timeless elegance of European furnishings. Architectural details such as crown and base molding, paneled sides, hardwood French doors and hand-carved accents showcase fine wine collections with a sense of luxury and style. Sealed seams, premium insulation and tinted double-paned glass provide thermal and UV protection.These options are included in the price of your wine cabinet. NOW EVEN QUIETER! The Euro 5200 is designed to showcase the largest wine collections with luxury and style, offering maximum storage capacity for 622 bottles. So I purchased this unit in 2013 and as previous reviewers have stated, it is beautiful. With that said, I encourage you to buy the upgrade to the warranty. Two years in and the cooling unit quit working. We followed all instructions with regard to storage of the wine, filter changes, space requirements, and even put a fan and air purifier next to the unit. To their credit, someone did come and replace the cooling unit and I only incurred the $49 charge, but it took a bit of work on my part. Last year I noticed one of the wooden racks had completely cracked, and we are not storing an inordinate amount of bottles in the "bulk" storage area. That too was replaced with the $49 charge (plus tip of course) and now I can see the wood on both sides "bowing" in the same area and wonder if it will crack again. If it does, I hope it is still within the warranty period. A shame that these defects become big problems in such a beautiful and expensive cabinet. Bought it and love it! Holds 52 cases of wine and told my wife(as this is my 25th anniversary present to her) we will have to travel the world to purchase wines to fill our gorgeous wine cellar! Thank you! I waited six months to write this review. I wanted to see how it would perform during the summer months and if any problems would surface as we filled it. This is undoubtedly the most talked about piece of furniture I have ever purchased. It combines a serious presence in the room, beautiful craftsmanship, and superb functionality. I love that normal 750ML bottles can go two per rack space and that the spaces are large enough for oversize bottles. The depth will not allow two tall bottles but we have found most producers do not use tall bottles with the exception of some whites so this has not been an issue. The noise level is fine for our open floor plan. I originally considered buying the noise hood but decided to wait until the unit was in place to see if it was required. The 1800 QT does operate at a very reasonable sound level. Bottom line - I love this unit and would purchase it again. You guys have been a pleasure to work with! I cannot wait to get the cabinet up and running. If you’re in the Scottsdale area, you should come over and enjoy a bottle of wine with us! My wine cabinet arrived in good condition and is working wonderfully. It is even more beautiful than expected and everyone comments on what a great piece of furniture it is (which is exactly what we wanted, not a "fridge" look). As a matter of fact, most people ask us why we didn't get a refrigerated unit and are incredibly surprised to find out that it does indeed cool! Beautiful wine cabinet that has become the centerpiece of my living room. The wine cooler is fantastic; in fact we have ordered another one. Many thanks. Thanks again for all the advice on initial operation of my cabinet. I followed your recommendation to clear the row of bottles below the exhaust. The cooling unit actually achieved a temperature of 57 degrees last night! I was surprised that it cooled the cabinet so quickly from 71 degrees (within 24h), especially considering that it's loaded with 550+ bottles. Le Cache reviewed my planned installation, noted a potential problem, explained options and modified my cellar to accommodate my site. We love our cellar and so do our neighbors.